Ho Ho Ho! 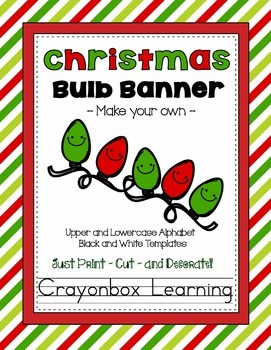 Bring in the holiday season with this "Make your Own" Christmas Lightbulb Bunting / Banner. 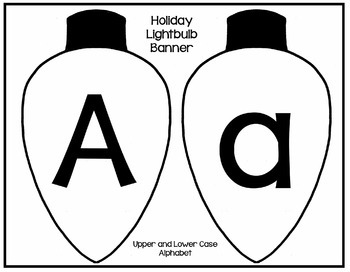 Featuring upper and lower case alphabet letters, in black and white. Print onto colorful cardstock or construction paper. String with ribbon, yarn, or string! You can print off the letters that you need to spell out Merry Christmas, Happy Holidays, or any phrase of your choosing. Individual light bulb pieces are sized to fit 2 per 8.5 x 11 pieces of paper. All you need to do is print, cut, and decorate! (Decoration on cover was purchased from Creative Clips and is not a part of this packet).